The Photographs from the FSA and OWI collection provide vivid scenes of the harshness of life in rural America during the Great Depression. Students can observe the effects of New Deal relief work by comparing pictures of makeshift shelters and tent cities with resettlement camps and showcase housing. Look at images of tents, migrant camps, and labor camps for examples. You might also look at images of Hightstown and El Monte for pictures of those model New Deal communities and images of the work of the Civilian Conservation Corps, a program designed to preserve the country’s natural resources while also creating new jobs. For a different perspective, review images tagged with WPA, many of which have lengthy captions that provide insight into the limitations of New Deal relief services. 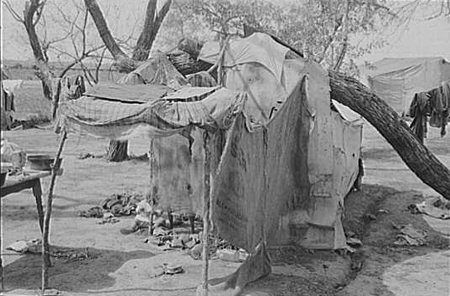 Students may then use Voices From the Dust Bowl to access songs that provide another kind of account of the stark living conditions of poverty-stricken Americans. Look for lyrics or song recordings such as the ones linked to below. Students can then write their own lyrics to a song that describes or tells a story about life in rural America during the Depression. Alternatively, students might create a similar type of song that relays the plight of Americans today who are suffering economically or who have been affected by floods or other disasters and compare the plights of people then and now.